This recipe fell in my lap yesterday. Literally. I opened the pack of Martha Stewart treat boxes, and out dropped the recipe for Double-Chocolate Brownies, which was printed on a little pink card. Not wanting to deal with anything other than the toffee I was packing, I threw the recipe card on the floor and got back to work. Flash forward to today when I’m cleaning up all the toffee-making fallout, where I find the recipe on the floor where I threw it. I figured the brownie recipe, being packed in a treat bag kit and all, would be a generic sort of recipe found in all my cookbooks, but I took a look at it on the way to the trash can and changed my mind. It was a healthy brownie recipe. Now packing a “healthy” type brownie recipe in a gift box kit was a bold move on Martha Stewart’s people’s part, so I figured this recipe must be pretty special. And with the interestingly wholesome ingredient list, I decided to try it right away. The brownies are winners. They have a denser, sturdier texture than some other brownies and are just mealy enough to let you know they’re healthy (I didn’t ground my oats enough, so that explains that),. but the biggest wallop comes from the chocolate. These are so chocolaty! They really fit the “Body and Soul” category they’re filed under because they are delicious enough to make you happy and healthy enough not to bring on guilt. I followed the recipe as stated but subbed brown sugar for the turbinado. I don’t keep oat flour around the house, so for that, I just ground up some oats in the food processor. And finally, the prune puree. I keep prune baby food on hand for occasions such as this so I had the perfect amount to put right in the recipe. These are super! I am not so sure Fuzz will like them because the chocolate flavor is so intense. But hey, more for me. These are grown-up brownies. Hi Anna, I made the brownies this morning, and they turned out really well. I was a little concerned if my flax substitute would work, but it was perfect (see post number 8 above for details). I added 2 tsp white vinegar, as most dark chocolate cakes and brownies call for that when eggs are absent. I also added ½ cup pecans and about 1/4 cup soy milk because the batter was very dry. I made a dark chocolate ganache topping for my portion (my husband didn’t want anything added). The brownies definitely have a dark chocolate taste and I think the prune puree enhanced it in some way. I ground the oats in our seed grinder (a coffee bean grinder that we reserve for other things). The oats ground down to a fine powder but still had a subtle graininess in the final product. My husband loves them and I would definitely make these again. Thanks for the great idea! I’m all for experimenting, but be careful. These brownies might now work with splenda. The 8 ounces (weight and volume) of sugar provides significant structure and Splenda weighs much less. Using flour would alter the texture and nutty oat taste. If you have flour and Splenda around, you might want to just grab a recipe off Splenda’s web site. But good luck if you do decide to experiment! I am most definitely going to try these this afternoon; I may sub Splenda for the turbinado, just to see if it’s possible with these without altering the texture too much. Do you think regular flour could be used instead of the oats? Lab Rat! (lol, I like typing that. Did you like Hershey Dark when you were a kid? Because I am a chocoholic, but when I was little, very dark chocolate was just too intense. Now it’s all I want. Okay, I’ll milk chocolate, but I like dark the best. Lisa, I keep meaning to try the flax sub too. If you make these with flax, let me know. Randi, that story is on my watch list. I like both authors and hope they get this worked out. The Missy Lapine book is really good and I own it, but having looked through Jessica’s book, I want to buy it as well. Some recipes are the same, but Jessica has quite a few different in her collection. I guess what I don’t understand is why there’s not room for two books. After all, there are more than two cookie cookbooks out there….or two cake books. The books are competing and the concept is similar, but I don’t see why they can’t co-exist. That said, I don’t have all the facts and don’t feel like I can take a side. Both women had/have good intentions. There is a big controversy brewing now regarding that sneaky chef book. Seems that Jessica Seinfeld wrote a book and the Sneaky chef author is claiming jess stole her idea. Angry Lab Rat, I don’t eat eggs very often and have struggled to find a suitable egg replacement. Much to my delight and surprise, I recently discovered that ground flax seeds soaked in water develop the same texture as raw eggs! I’ve been using them in brownies, corn bread, etc., and it really works. The flavor is mild enough that you don’t notice it and of course flax seeds are one of those power house foods. To substitute for one egg I grind two tablespoons of fax seeds and stir it into 1/3 cup water that has been boiled. I stir it well and let it stand for about three minutes until the mixture thickens. Not sure he’ll like them because the chocolate is too intense?! Seriously? I can’t wrap my head around the thought that chocolate could be considered too intense! If someone presented a vat of chocolate to me, I’d likely jump in and drown out of sheer addiction. By the way, thanks for the link to my blog. Glad you like it! P.S., my wife is allergic to all egg products (even the smallest amount). It’s a recently-developed allergy for her. 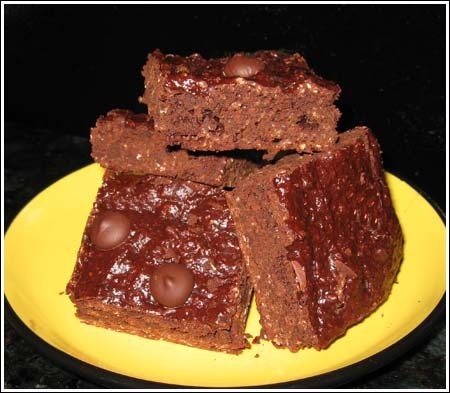 I’d love to get a recipe for such delectibles as these brownies that don’t need egg and still taste the same. I just checked on that cake. I think what you are referring to is coffee crunch cake from a place called Blum’s. I have a peanut brittle version in one of my Richard Sax books (one that sounds REALLY good) and found a few more on-line. This was on Recipelink. I’ll have to try this. Sounds like it’s not a meringue, but a candy brittle. Adjust rack in lower third of oven; preheat oven to 350 degrees F.
Sift flour, 3/4 cup sugar and the salt onto a sheet of wax paper; set aside. Using an electric mixer, beat egg yolks with 1/4 cup sugar until thick and pale yellow. Add water and beat until thickened, about 4 minutes. Whisk egg whites in bowl of a heavy-duty mixer just until frothy. Add cream of tartar; whisk until soft peaks form. Add remaining 1/2 cup sugar in a steady stream, whisking until thicker, stiffer, glossy peaks form — about 2 to 3 minutes. Whisk in vanilla, lemon juice and lemon zest. Pour yolk mixture over whites. Fold together with a rubber spatula. Using a metal spatula, scoop up a third of the flour mixture and sprinkle over mixture; fold in with a rubber spatula. Repeat two more times just until ingredients are incorporated. Gently pour batter into an ungreased 10- inch round tube pan with removable bottom (such as an angel food pan). Level top with a rubber spatula. Bake for 50 to 55 minutes, or until top springs back slightly when lightly touched. Invert pan over a long-necked bottle to cool for about 45 minutes. To remove cake from pan, slip a flexible metal spatula down one side of pan; slowly trace perimeter to release the cake. When sides are free, push up on bottom to release cake. Tilt cake, with removable bottom still attached, and gently tap bottom against counter to loosen cake. Rotate cake, tapping a few more times, until it appears free. Cover cake with a rack, and invert; remove bottom of pan. Generously oil a large baking sheet; sift baking soda onto a sheet of wax paper; set nearby. Combine coffee, sugar and corn syrup in a heavy, 4-quart saucepan. Place over medium-low heat, stirring occasionally, until sugar dissolves. When mixture is clear and begins to boil, increase heat to medium- high; cook until mixture reaches 290 degrees on a candy thermometer. Toward end of cooking (around 270 degrees-280 degrees), stir occasionally to prevent mixture from scorching and becoming too foamy). Remove from heat and stir in baking soda (mixture will foam up fiercely). While still foaming, pour out onto oiled baking sheet. Do not spread; let cool undisturbed for at least 1 hour. Crush into very small pieces. (Place between 2 sheets of wax paper and tap or roll with rolling pin.) Store in an airtight container. Combine cream, sugar and vanilla; beat until cream holds soft peaks. Slice cooled cake into 3 equal layers using a serrated knife. Spread whipped cream between each layer, carefully stacking layers. Spread remaining whipped cream over top and sides of cake. Refrigerate. Just before serving, generously sprinkle top and sides with the coffee crunch. Emilie, consider these “detox” brownies. Uh, sort of ;). Liz, I will study up on Coffee Crunch Cake and see if I can find something similar or perhaps easier to make. About the issue with your son, this might be a good time for you to buy Missy Lapine’s book The Sneaky Chef. I am really enjoying it. The premise of the book is hiding healthful purees in every day, well-loved foods. While I think the best thing is to introduce foods in their natural form and keep re-introducing those same foods cooked different ways, I like the idea of hiding certain “powerhouse” foods that might not get eaten otherwise into other things. I’m just mentioning this since you mentioned your son. Missy has such a healthy attitude towards feeding kids, it’s quite refreshing. So many parents drive themselves crazy over it and while it’s an important issue, it needs to be addressed with common sense and solutions. She does that. It’s a great book. I am trying to also find ways to feed wholesome things like veggies and cereals to my 14-month old son. Hope to try this recipe for me, not him! (It has Chocolate). On a different note, have you ever tried a recipe called Coffee Crunch Cake? It’s a layer cake with white or yellow genoise-type cake with a slightly coffee buttercream frosting and shattered meringue-type pieces of very light coffee crunch on top. It’s something that seems to only be on the west coast and I can’t find it on the east coast. It is VERY good, but the recipe seems difficult and I am short on time. Maybe as an experienced baker you could try it and post results one day? A low fat brownie sounds good to me, after being a gluten on vacation. They look pretty, and I like the choco chips on top. Deb, believe it or not, my daughter loved these. She’s not a big oatmeal fan, but she didn’t even notice it. Okay, Anna… add this to my brownie list – I NEED my brownie fix… just need to get rid of a triple layer German Chocolate birthday cake first… Oh, the trials of life!